Lee began woodworking in a big way in 2012. He lived in Grundy Virginia for a year while attending law school. We waited that summer (with bated breath) to hear whether Northern Kentucky University accepted him as a transfer. I applied to both NKU and the Appalachian School of Law in Grundy, I was a year behind Lee. We got married May 18, 2012; and I started my first year, and him his second, at NKU that August. We found a house to rent in Florence, Kentucky. Our only concern was a fenced in back yard for our dog, but it happened to have a garage as well. For the first time, Lee had a place of his own to set up his tools. Between 2008 and 2012, Lee and I moved a total eight times, we both worked and went to college. Lee's woodworking tools were parked in his parents' garage. We decided not to work while in law school due to the demands of the same. I went to law school year round and finished early. We spent any extra time in the garage making cutting boards. Lee also made us a coffee table and a bed. We made a bed for my parents and that project took a whole summer to complete, as we both had classes. Being broke has inspired and fueled some of Lee's greatest accomplishments. We've never had a lot of extra money to buy furniture, or gifts for people. We've either made our own furniture or redid pieces we've found at peddler's malls or antique stores. My favorite gift thus far, is a "doll dresser" he made for our niece. Her grandparent's bought her a doll bed from Rector's, and Lee made a dresser to go with it. Lee and I aren't really social people. We are homebodies who spend all our time on projects. That's how I got involved in woodworking. Lee is my best friend, my sister says that we are like Lily and Marshall on How I Met Your Mother. I learned to plane the boards, use the router, and sand. 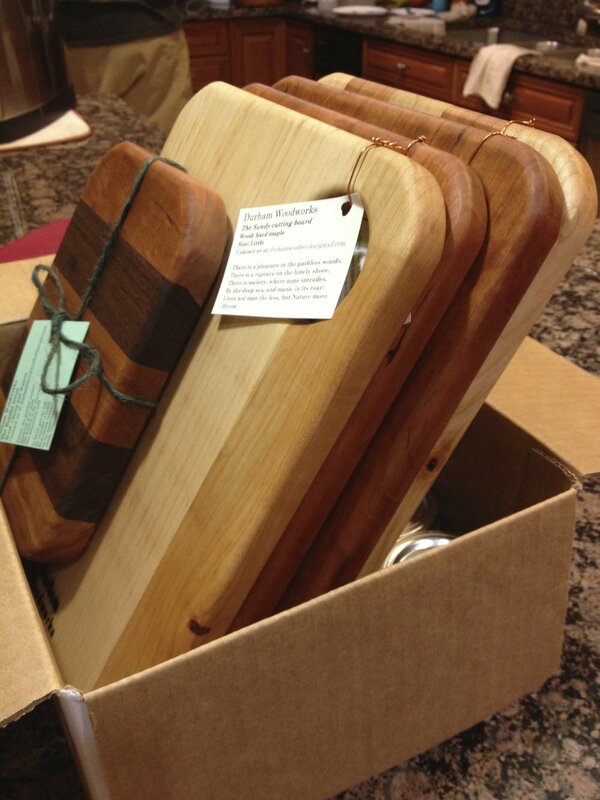 We sold our cutting boards, and participated in a pop up shop for the Mercer County Arts Council. Lee grew up in Harrodsburg, Kentucky. I e-mailed stores in that area and asked if they would sell our cutting boards. We didn't get too far with this. We talked about doing festivals, but became overwhelmed with finishing law school, moving home, and taking our bar exams. We moved to my hometown of Brandenburg, Kentucky in May of 2014. I worked for my Dad at his law firm, and we lived in the apartment below his office. My aunt and sister also worked there, and still do. And we woodworked. And we moved into our own home for the first time; it had a fence for our dog of course. And we woodworked. People got married. We woodworked. People had babies. We woodworked. People graduated. We woodworked. People passed on, we woodworked. In the mean time, Lee began work as a staff attorney for a circuit judge in our area. Lee and the Judge have developed a close bond, which has been a real blessing to Lee. The Judge has been so supportive of Lee. As for me, I was representing children that had been removed from their parents, and parents that had their children removed (it is the luck of the draw, as the court appoints you to cases and to your clients as they come up). This was an invaluable experience, but I got to the point where the totality of the circumstances of my life were stressful. It was hard to leave something that I had worked for, for so long, for the unknown. I'm still uneasy about our future, there is still so much to figure out, but if you go confindentaly in the directions of your dreams, life will surprise you with unexpected favors. So, we began, and we forge on, hopeful for what will become. Newer PostBuilding Durham at Dave's. Older PostAllow Yourself to Begin..